Stephanie’s memorial service will be 2 p.m., Thursday, March 28th at the Wallace Family Funeral Home & Crematory, 1115 E. 19th St. N. in Newton. Conducted by Pastor Chad Jennings of the St. Luke United Methodist Church in Newton. The family will greet friends following the services on Thursday, March 28th from 4-6 p.m. at the funeral home. Inurnment will be at the Newton Union Cemetery in Newton. In lieu of flowers the family requests memorials in Stephanie’s name for her husband, Phil and her children, Alexys and Wulfric (Please make checks payable to Phil Pecora). Memorials may be left at the funeral home. If mailing your memorial to the funeral home please add, ATTN: Pecora Family on the envelope. 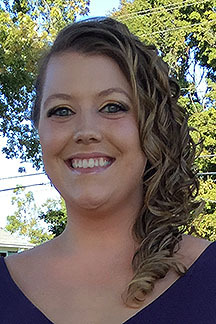 Stephanie Rae Klier Pecora, the daughter of James B. and Colette R. Foreman Klier was born on August 16, 1989 in Newton, Iowa. She was a graduate of Newton High School in 2007, where she was active in tennis, band and color guard. She had also studied Nursing RN at DMACC. On December 10, 2016, Stephanie was united in marriage and friendship with Philip Paul Pecora in Des Moines, Iowa. They were blessed with daughter, Alexys and son, Wulfric. She enjoyed traveling and spending time with her family and friends. Stephanie was a loving and devoted wife, mom, daughter, sister, aunt, granddaughter, niece and friend. Stephanie went to be with the Lord on Thursday, March 21, 2019 at her home in Mitchellville. She was 29. Stephanie was preceded in death by her grandfathers, Ronald Foreman and James Klier; grandfathers-in-law, Christopher Pecora and Marvin Kallemyn; grandmothers-in-law, Jeannette Pecora and Kathryn Rus; and great-grandmothers, Marjorie Kerr and Ruth Foreman. Those left to cherish Stephanie’s memory are her husband, Phil of Mitchellville; children, Alexys and Wulfric Pecora; her parents, Jim and Colette Klier of Newton; brother, Jimmy Klier of Johnston; sister, Alina Tasso of Arizona; her grandmothers, Jacqueline (Kerr) Foreman of Newton and Shirley (Palmer) Klier of Pleasant Hill; mother-in-law, Mary Kallemyn of Des Moines; father-in-law, Thomas Pecora of Mitchellville; her brothers-in-law, Joe (Laura) Pecora of Urbandale and Ron Hawk of Des Moines; her sister-in-law, Liz (Yugang) Zhang of Hong Kong; several nieces, nephews, aunts, uncles and cousins. Stephanie was deeply loved and will be forever cherished and missed. She will never truly be gone since she will live on through her children who glow as a result of her kind, sweet and caring love for them.